Home page > Follow-up	> Resonances	> Exhibition "Breaking the silence - December 2011	>Visit of the exhibition "Breaking the silence"
Visit of the exhibition "Breaking the silence"
“The Israeli organisation Breaking the Silence has collected and compiled more than 2500 hours of interviews by soldiers after they finished their three-year-long compulsory military service. 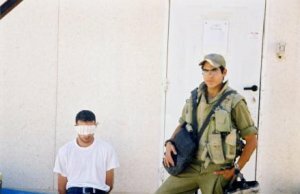 They tell, among other things, about everyday life in Hebron : how the soldiers see their mission/duty to protect the Jewish settlers of Hebron, a town where most of the population is Palestinian. 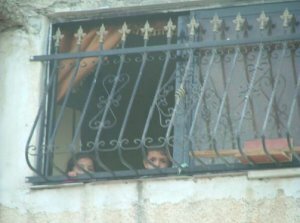 How the presence of the Israeli military affects the civilian population. 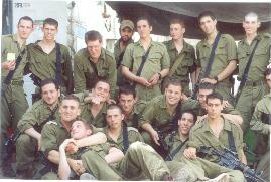 The groups of visitors are welcomed by young Israelis in their twenties, all of them former soldiers in the IDF (Israeli Defense Force). In pair, they comment the documents exhibited. Our two guides’ names are Simcha Levental et Avishar Stollar. 1a. How the project «Breaking the Silence» came to life. Simcha Levental introduces himself. 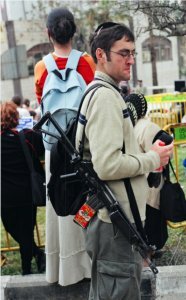 He is a 29-year-old Israeli. 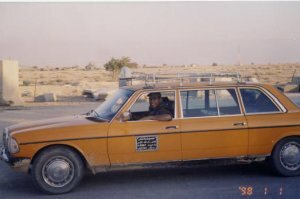 He served in the Israeli army in Hebron from November 2000 to November 2003. After he left and went back home, he met some of the guys again and they started talking together about what they had experienced during their military service. “We discovered that we were all feeling quite uncomfortable with that we had done during those 3 years. And also, because that there was such a huge gap between what we had experienced and what our families imagined about the situation over there. We felt the need to do something about it, to prevent the whole thing going on like that”. They first thought each of them should write down a text about their personal experience. 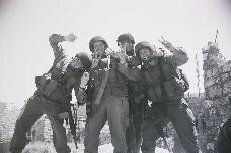 They also made a choice among the pictures they had taken during their military service. 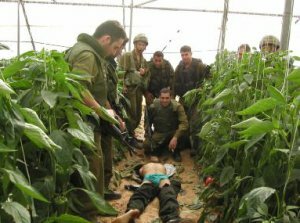 They didn’t choose the most horrific ones, just pictures showing the common day-to-day life and job of the soldiers serving in Hebron. 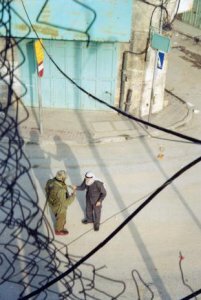 They brought it all to Tel Aviv and invited the public to have a look at the exhibition they had called: ‘Bringing Hebron to Tel Aviv’. 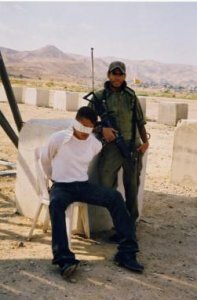 The aim of it was to try to fill the gap existing between what Israeli people (think they) know about the conflict and what they as soldiers experienced, witnessed, took part in: they wanted to make the public aware of the reality of occupation. Avishar Stollar introduces himself. He is 28 and comes from a secular educated family, ‘left-wing’ and ‘ liberal’ in Israeli terms. 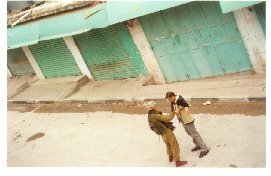 Like many soldiers, he served in the infantery, in the area of South Hebron between 2001 and 2004. His story started before he was recruited. He calls it: ‘How you adapt to being an occupier’. 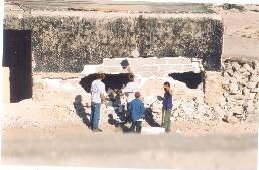 We have hundreds of questions to ask to our two young guides but they suggest we kept them for the end of the visit. As they say, we might find answers in the comments they are now going to make for us on some of the pictures that are exhibited. 2. Comments on some of the pictures exhibited. 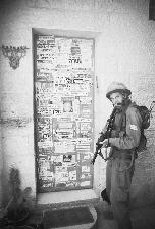 Picture 2 : picture of a settler of Hebron. Carrying a gun. The settlers are armed by the militaries. 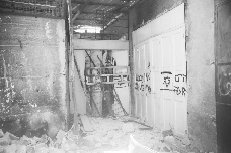 Photo 3 : Palestinian house wrecked by settlers. Picture 4 : Settlers’ children collecting stone they will throw at Palestinian schoolgirls on their way to or back from school. Photo 5 : A Palestinian ’terrorist’ in the back of an IDF van. Picture 6 : memorial of an Israeli baby whose mother was killed by a Palestinian sniper. 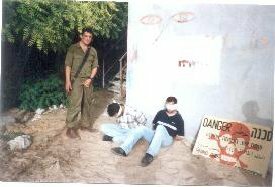 Pictures 7 : Pictures of soldiers posing next to the dead body of Palestinians. Photos 8 : Different pictures with always the same soldier on. 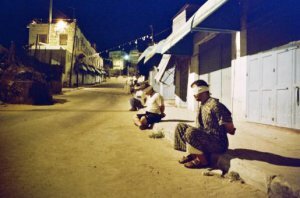 Most of the activities of ‘Breaking the Silence’ are done in Israel. The organisation gets a big coverage when it comes to publications. 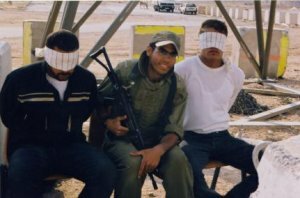 The military is a holy structure in Israel: ‘Breaking the Silence’ is using this to try to reach a large audience. It is clear that it is as important, if not even more, to meet the young people before they join the army. The fact is ‘Breaking the Silence’ can’t go into the state schools. They only go into the private schools. 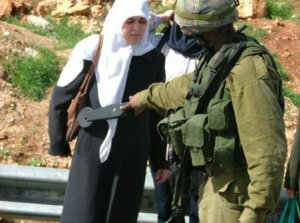 Yes, in the Israeli public, there is this feeling everybody is against us. And the people who criticize the government’s policy are still considered as self-hating Jews. If you refuse to go to the army, you go to Martial Court and are sent to prison. As a reserve soldier, he has to go to the army one month every year and will be until he is 50. Even though people know about his activities with ‘Breaking the Silence’ he is still called. The culture of war transforms people: personalities change, moral codes are subverted, values are supplanted and masks are constructed to dull the pain of what they did and didn’t do in uniform. All the pictures and their ***captions*** were borrowed from the exhibition. We thank the people in charge of the exhibition as well as our Israeli guides for allowing us to use them here. All the pictures and their ***captions*** were borrowed from the exhibition. We thank the people in charge of the exhibition as well as our Israeli guides for allowing us to use them here..
 All the pictures and their **captions*** were borrowed from the exhibition. We thank the people in charge of the exhibition as well as our Israeli guides for allowing us to use them here. 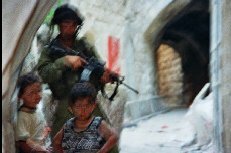 Reviewed by Dorit Naaman, a film theorist and documentarist from Jerusalem teaching at Queen’s University, Canada, an activist for a just solution to the Palestinian-Israeli impasse. Testimonies - "Breaking the silence"